The market for commercial beauty products bloomed in Third Republic France, with a proliferation of goods promising to erase female imperfections and perpetuate an aesthetic of femininity that conveyed health and respectability. While the industry’s meteoric growth helped to codify conventional standards of womanhood, The Force of Beauty moves beyond the narrative of beauty culture as a tool for sociopolitical subjugation to show how it also targeted women as important consumers in major markets and created new avenues by which they could express their identities and challenge or reinforce gender norms. As cultural media—from magazines to novels to cinema—and cosmetics companies urged women to aspire to commercial standards of female perfection, beauty evolved as a goal to pursue rather than mere biological inheritance. The products and techniques that enabled women to attain society’s feminine ideal also taught them how to fashion their bodies into objects of desire and thus offered a subversive tool of self-expression. Exploring this new sense of empowerment, Grout reveals the French commercial beauty industry’s efforts to reconcile traditional norms of respectability with new ideas about female sexuality. 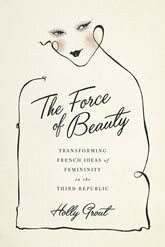 Grout draws on a wide range of primary sources—hygiene manuals, professional and legal debates about the right to fabricate and distribute “medicines,” advertisements for beauty products, and contemporary fiction and works of art—to explore how French women navigated the changing views of their femininity. Her seamless integration of gender studies with business history, aesthetics, and the history of medicine results in a textured and complex study of the relationship between the politics of womanhood and the politics of beauty.